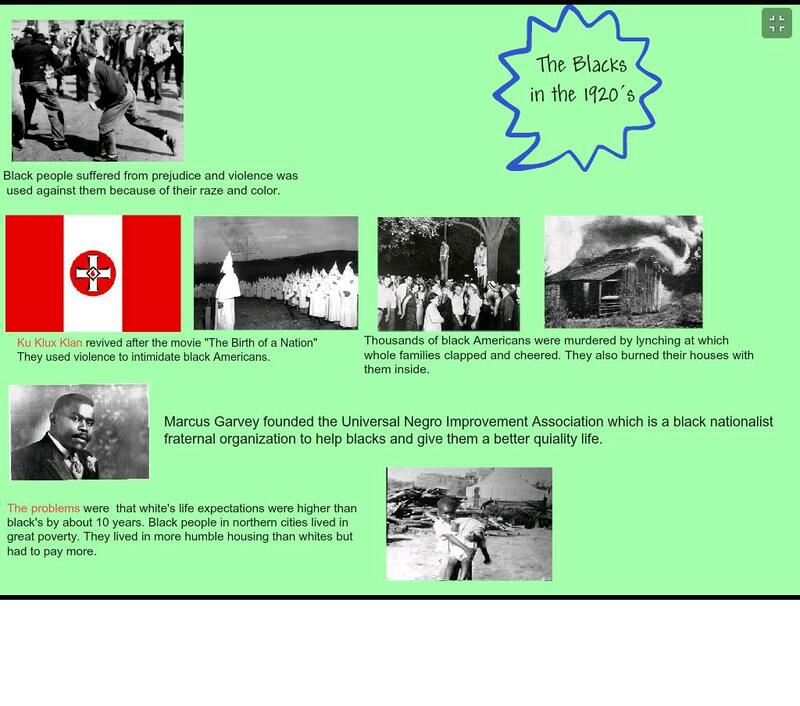 We have started working on our new topic for this year in History, The League of Nations in the 1930s. Our teacher, Lenny, asked us to watch a video and answer the following questions. 1. How does the video open? What might the connection between the League and the opening scenes in Poland be? The video starts by saying how the League had failed at mantaining peace, enforcing disarmament and establishing stability. The opening scenes show Hitler’s SS taking over Poland which was the start of the Second World War as Germany and the USSR, in a secret agreement in the Nazi-Soviet Pact, stated that they would attack and divide Poland. The problems were that its population was booming which meant more than a million mouths to feed, she was an isolated country that needed to open up trade to get materials, it had no natural resources (agricultural failure) to exploit on its own, there was very high unemployement, it was very affected by the depression and it relied on international networks to import its goods. 3. What was the role of the army in Japan? Step by step, Japan started being under the control of the military. The army was first, and the polititians second. The army controlled the education, they made learning martial arts compulsory. 4. What did army leaders believe Japan needed? They thought that expanding towards eastern Asia would benefit the empire as they would get natural resources and more land for its very large population. 5. What was the value of Manchuria? It was rich in resources that the Japanese desperately needed for their economy, it meant more land for its population and they thought it was perfect for the “elimination of the Chinese subhuman race”. 6. What happened at Mudken? There was an explosion of a Japanese railway in Mukden, China, which was planned by themselves but blamed on the Chinese since they wanted everyone to believe that China was out of control and that they needed to intervene since they wanted and excuse to attack Manchuria. 7. What did the League do about it? The League consulted the Japanese ambassador in Geneva. 8. What was Japan’s reaction to the decision of the League? They thought it was impossible to accept what the report stated and decided to leave the League. In our History class, in pairs, we were given a source and had to analyse it and figure out from which topic it was. If it was a short term cause of the Second World War or a characteristic of the Boom in USA or a cause of the Wall Street Crash or others. 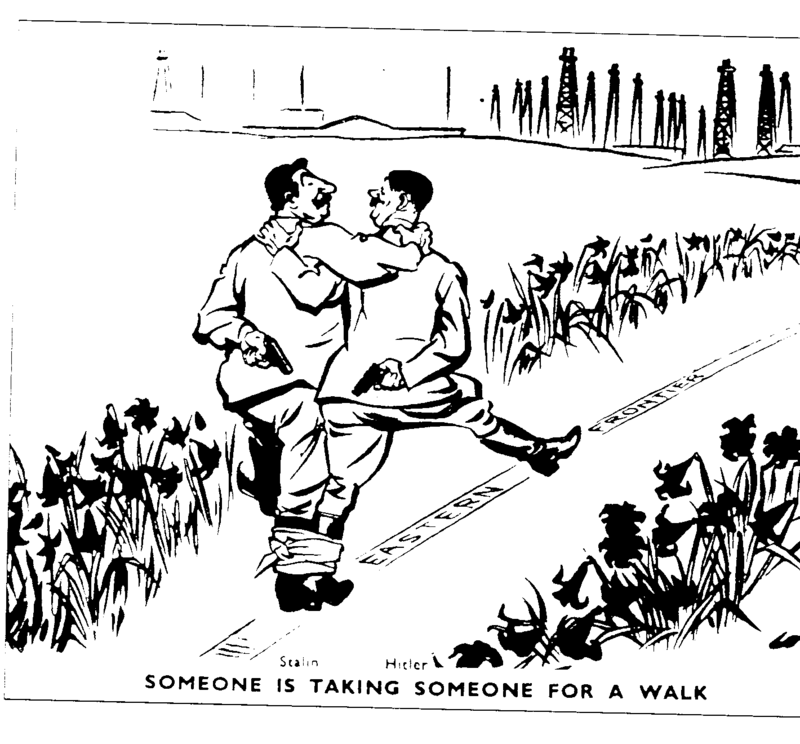 This source is a cartoon that shows Hitler and Stalin saluting each other while a body lies between them. It makes a great use of irony since their body language expresses that they are being polite to one another, since they’ve singed a pact of mutual protection, in spite of hating and not trusting each other which can be seen in their dialogue. 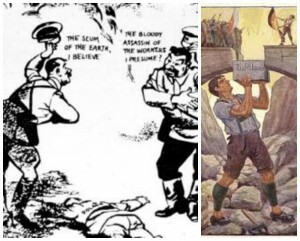 The man between them represents Poland and it’s lying there either dead, injured or unconcious since the other part of the pact was to attack and divide Poland between them. This source is a poster. In the poster, a bridge is shown, in which there’s a missing brick in the middle of it. On one side there are Austian people and on the other side there is German person. Under the bridge there is a German man that looks like “the average german” under nazi regime, putting the missing brick (on wich it says “Anschluss”) back. The message of this source, is that Germany was “putting the last derail” so Germany and Austria could get together as one powerfull country. Hitler also said that this was the best thing to do for both countries. In this source, Austrian people seem to be excited about Anchluss being completed. This was not 100% true. 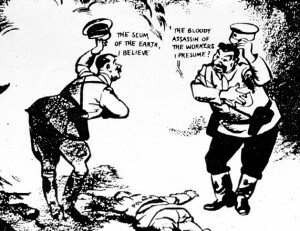 In 1939, Hitler and Stalin signed a pact called the Nazi-Soviet Pact which said that they wouldn’t attack each other and that they would invade Poland, the USSR from the west, and Germany from the right. By signing this pact Hitler broke the Policy of Appeasement, which consisted in letting him invade without being stopped. Britain accepted this because she hoped to have Hitler as a future ally against Communism. However, when he signed the pact with the USSR she realized that he wasn’t to trust (since he had signed it with a Communist country). 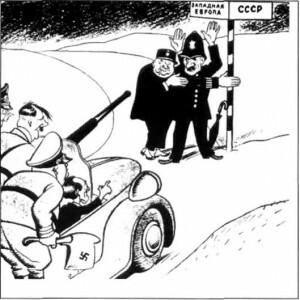 Hitler was scared that if he invaded Poland without this treaty, the USSR would declare war to Germany, so he felt safer having an alliance with the USSR that consisted in mutual defence and protection. 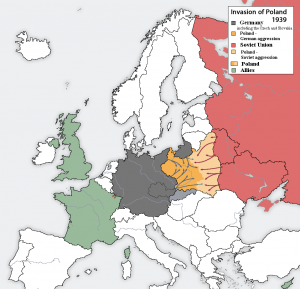 Britain and France guaranteed that they would defend Poland if Germany invaded. Finally, they declared war to him. This pact was the straw that broke the camel’s back, meaning that WW2 started. This British cartoon shows that the ‘friendship’ between Hitler and Stalin was totally based in their own convinience, and that it wouldn’t last, since Stalin did not believe that Hitler would keep his word but he hoped for time to build up his forces against the attack he knew would come. This is a GCSE video (British point of view), which summarizes and explains the Nazi-Soviet Pact, and why Hitler and Stalin signed it. This is a soviet cartoon that shows the French and the British directing Hitler away from western Europe and towards the USSR. This cartoon shows a sarcastic point of view between the two leaders, it cricizes both Hitler and Stalin, and it shows the hatred between them. 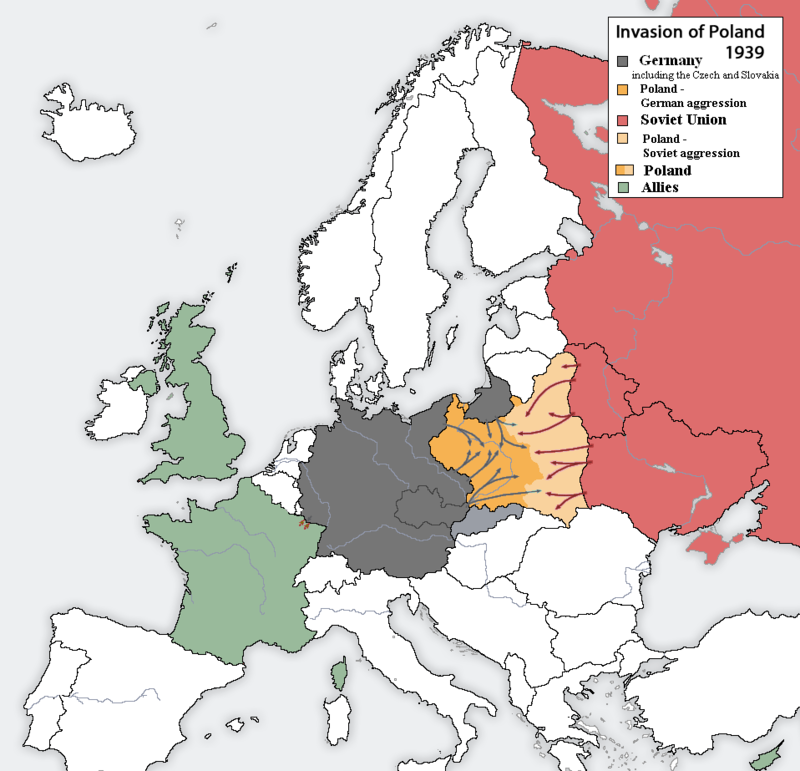 This image shows the invasion of the Polish Corridor from Germany and Russia. How far were the 1920s a won decade? During the 1920’s there were lots of “ups and downs”. In the following essay I am going to analyse whether this decade was a won decade. On the one hand, The League of Nations had lots of pros during the 1920s. 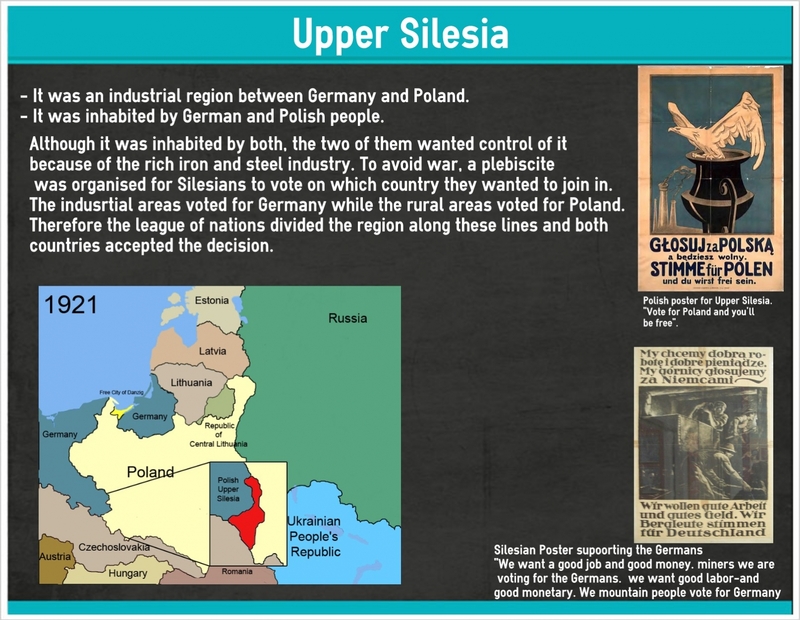 Like, Upper Silesia, because since both Germany and Poland wanted control over this industrial region, a plebiscite was organized. The rural areas voted for Poland and the industrial areas for Germany, therefor it was divided. 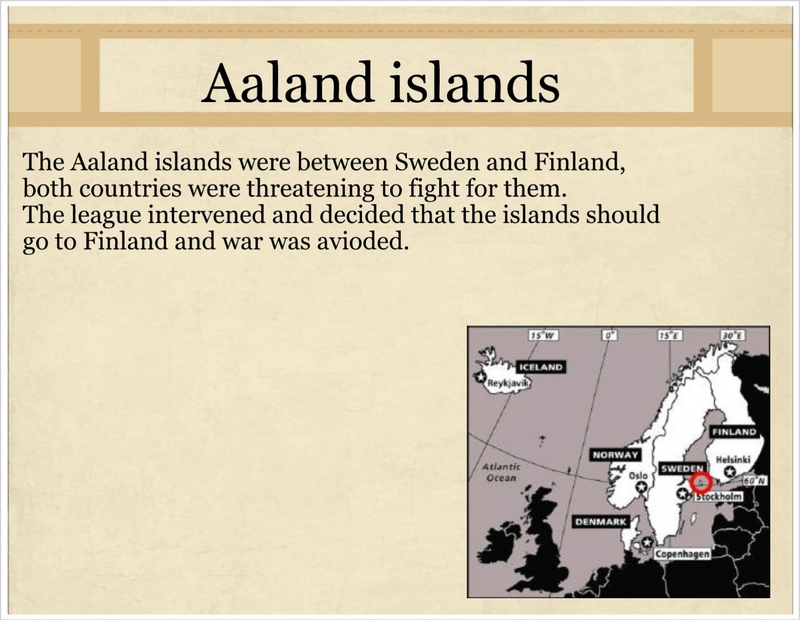 Or like the conflict with the Aaland Islands. Both Sweden and Finland were willing to fight for them so the League interfered and after studying the matter closely, she decided that they should go to Finland since they were closer. Corfu was also a success even though it was harder to solve. Because when Tellini and his team were ambushed and killed, Mussolini took this situation as an excuse to occupy the island of Corfu (because it was convenient for trading) by blaming the Greeks on their death, even though he knew it could’ve been someone from another country. When Greece asked for help, the League condemned Mussolini’s actions and demanded that Greece should pay for compensation but that the money would be held by the League and then given to Italy, if and when, Tellini’s killers were found. Although Mussolini accepted, he went behind their backs and got the Greeks to pay directly to Italy and just then, he withdrew from Corfu. And finally, there were a lot of successful comitees like, what the League did for the refugees and prisoners of war by getting them back to their homeland, what they did as rewards working conditions by limiting the hours that people could work to a maximun of 48 hours per week and 8 per day; they worked hard to defeat leprosy and started a global campaign to exterminate mosquitoes which reduced cases of malaria and yellow fever and they freed around 200.000 slaves, reduced the death rate of African workers from 50% to 4% and kept careful records of what was going on with problems such as drug trafficking, prostitution and slavery. Anyway, the League also had lots of cons like Vilna. Vilna was Lithuania’s capital but was mostly inhabited by Poles, so one day, a private Polish army simply took over it. Lithuania appealed for help and the League protested to Poland but she wouldn’t withdraw. So the League sent British and French troops to force the Poles out but they did not. And since the French saw Poland as a possible future German ally she backed-off and so did Britain since she wasn’t prepared to act alone. In the end, the Poles kept Vilna. Or like the Geneva Protocol. Britain and France drew this up and it said that if two members were in dispute they would have to ask the League for help and that they would have to accept the council’s decision. But before it was signed, there was a general election in Britain and the new government refused to sign the protocol worried that Britain would be forced to agree to something that wasn’t in her interests. And finally, disarmament was also a failure since it was supposed to be for all the countries but in the end only Germany ended up disarming. On the other hand, USA in the 1920s is mostly related to a great year because of the morals, for example, since they were less restrictive especially for women since their role changed a lot in the city. They were allowed to wear more daring clothes, to work in factories (although they didn’t get paid as much as men did), they could now smoke, kiss, drink in public, they could go out with their boyfriend and without a chaperone, they could wear more make-up and they could vote. Also, since people’s working time got reduced, they now had time to go to the theater for example (there was a boom in the entertainment industry). And there was also an economic boom since the home market was large with lots of natural resources and didn’t need to import many raw materials nor export all its goods. The USA led the world in most areas of industry and the managers of these industries weren’t just selling in the USA, they were also exporting a lot. The republican policies were also pros since they helped the economy to rise. The tariffs protected home products from foreign competition an allowed American companies to grow even more rapidly, low taxation allowed people to have extra money for consuming more products. And finally, the state mind also helped a lot since it was the attitude that people had after WW1, it was that they started believing that since they could die any day, they needed to live their lives the fullest with the biggest house, the best car, etc. However, it wasn’t only joy and happiness for the Americans, there were a lot of cons for them too. Isolation was one since, for example, when they wanted to export Europe put tariffs against US products. And during the 1920s, farmers weren’t happy at all. Because they didn’t like nor approve of the less restrictive morals since they were more conservative and because there wa overproduction. This was caused because during WW1, farmers used to sell food to Europe since she had stopped producing and their farmers were fighting. But when the war was over, they stopped buying to the US since they couldn’t afford it because imported goods are more expensive. And it was also caused because fertilizers appeared and they made crops grow faster and last longer but the goods would expire and the farmers had to throw them away. And finally, intolerance towards immigrants and black people and the red scare were also a con. What made it worse was that a vast majority of Americans were either immigrants or descendants of recent immigrants. The Red Scare was the fear of immigrants brining communist thoughts to the USA and the Ku Klux Klan (KKK) was a white supremacy movement that used violence to intimidate black Americans. In conclusion, the 1920s wasn’t a own decade nor a very bad decade. It was partly both. In History we watched the movie ‘Midnight in Paris’ since we are studying the boom in USA and important people in USA in the 1920’s. We made a list of them and, as our project, each of us had to choose one and make a presentation about them. I chose Scott Fitzgerald.